Having transformed the Galileo program into a fully public procurement, European agencies have announced a schedule that would lead to contracts for the €3.4-billion project by the end of 2008. And non-European companies may be involved in providing certain components and services to the effort. The plans were revealed in presentations by high-ranking figures from the European Commission (EC) and European Space Agency (ESA) speaking at the Munich Satellite Navigation Summit in Germany, February 19–21. In comments at the conference, Jacques Barrot, EC Vice President and commissioner for transport and energy, and Giuseppe Viriglio, ESA director of telecommunications and navigation, indicated that they hope to see invitations to tender (ITTs, essentially, requests for proposals) to be issued July 1. Deadline for tenders would follow within a few months, followed by a review of bids and contract awards in December. Identification of prospective bidders and requests for information will precede the ITTs, activities that will probably begin within the next few weeks. The EC and ESA still need to complete a “delegation agreement” that would outline the responsibilities and principles under which ESA would act as the prime contractor — the procurement agent and design authority that will oversee the engineering work and contracts under which the ground and space infrastructure would be built. It will receive an estimated €195 million for that role. 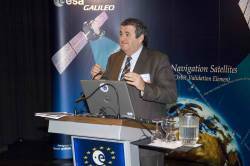 ESA will set up a new Galileo directorate, Viriglio said, to handle its responsibilities. The European Commission will act as the Galileo program manager, taking on additional staff to handle the work, according to Paul Verhoef, head of the Galileo Unit in the EC’s Directorate-General for Transportation and Energy. The ESA directorate would have about 30–40 staff members and the EC Galileo unit would gain about 35 persons to handle program management, according well-informed sources. The procurement contract schedule will have to be met in order to have a chance to meet the goal of Galileo having a fully operational capability (FOC) by 2013. The acquisition is divided into six “work packages”: system engineering support, completion of ground mission infrastructure, completion of ground control facilities, launchers, satellites (26 in batches of 10–12, 6–8, and 6–8), and operations. No company or consortium of companies may bid for more than two of the six packages. The prime contractors must subcontract at least 40 percent of the work to companies not affiliated with them. ESA Takes the IOV Reins. Meanwhile, ESA has already taken over as prime contractor for the in-orbit validation (IOV) phase of the program after a billion-euro contract with European Satellite Navigation Industries (ESNI) was terminated in December. IOV includes construction and launch of four full-fledged Galileo satellites in 2009–2010 to form a mini-constellation for additional validation testing before the other 26 spacecraft are launched in 2011–13. All the other IOV contracts will be retained as will the associated technical baseline, said Viriglio. European officials still need to figure out how they will cover an estimated $350-million overrun in IOV caused by delays, unexpected security costs, a change in the Open Service signal design as a result of the 2004 EU-US agreement on interoperability of GPS and Galileo, and dependence on a single customer (ESNI). European officials repeatedly emphasized that the €3.4 billion was the most that they would spend on implementing Galileo, and that competition for contracts would take place under European Union (EU) rules rather than ESA procurement policy, which allocates 90 percent of funds to businesses based on the contributions from the member states in which they are located. The calculation of $3.4 billion is based on cost estimates by ESA, drawn primarily from industry proposals and earlier studies and concession negotiations under the Public Private Partnership (PPP) concept, which was discarded last year. The largest portion of the costs would be for the space segment — building and launching satellites — estimated at €1.6 billion; the ground segment, €400 million; operations, €275 million; and systems engineering support, €150 million. Members of aerospace companies that will probably compete for the contracts were less optimistic in their estimates of whether $3.4 billion will be enough. Galileo has one satellite in orbit, the so-called GIOVE-A, which launched in December 2005 and will reach the end of its design life in March, although its builder, Surrey Satellite Technology Ltd., predicts that it will continue operating at least through the end of 2008. A second, larger spacecraft, GIOVE-B, is now scheduled for launch on April 26 from the Baikonur space center in Kazakhstan. More than €2.6 billion has been spent on Europe’s satellite navigation program to date, mostly by the EC and ESA. This includes €133 million for the definition phase, €1.5 billion for the IOV phase, €520 million for the European Geostationary Navigation Overlay Service (EGNOS), and €480 million for Galleo-related projects financed through the EU’s Framework R&D programs. EGNOS is a satellite-based augmentation system that will be integrated into the Galileo infrastructure and operations over the next few years. Who Calls the Shots? A new regulation regarding financing, governing structure, and procurement procedures for Galileo will be taken up by the European Council in April. But now that the funding and acquisition process have been largely resolved, the outstanding issue facing the Galileo program is governance, that is, the matter of political direction and control of the system’s implementation. Now that the funding and acquisition process have been addressed, the outstanding issue facing the Galileo program is governance, that is, the matter of political direction and control of the system’s implementation. That, in turn, will have a substantial effect on whether the program is able to stay on schedule and within budget. Until the abandonment of the PPP, that issue had seemed fairly clear. The European GNSS Supervisory Authority (GSA), a Community agency with a executive board made up of directors from the EU member states, would sign and monitor a contract with a private consortium to build and operate Galileo under a 20-year concession. Now, however, the GSA has lost that primary supervisory role and has come under pressure from both the EC and the European Parliament, which approved the €3.4-billion Galileo program budget last November. The 2004 EC Council regulation that created the GSA also assigned it other responsibilities: market development of the Galileo operational phase, GNSS-related research, technical certification of the components and services of the Galileo system, management of Galileo security aspects, coordinating radio frequency activity, and managing the agreement with an EGNOS service provider. The EC would clearly like to bring the GSA back under its direct control, either as a separate but subsidiary entity or by absorbing key technical staff members into the Galileo Unit headed by Verhoef. “What we need is the expertise of the GSA, either directly or through a transfer to an EC office,” Verhoef said at the Munich conference. Two related approaches are now under consideration: retaining a GSA, separately or within the EC, and restructuring it as a GNSS Security Agency that would handle GNSS security issues and, perhaps, technical certification of the Galileo system being built under the supervision of ESA. ESA would take over most or all of the GSA’s technical responsibilities and the EC Galileo Unit, as program manager, would acquire most of the rest. Parliament Joins the Fray. In late January, Parliament weighed in with a proposal before the Industry, Research, and Energy (ITRE) Committee that would abolish the GSA, turn responsibility for ensuring the Galileo system’s security requirements over to a new Committee on European GNSS Programs, and establish an Interinstitutional Monitoring Group (IMG) consisting of representatives of the parliament, the European Council’s Presidency, and the EC. The proposed actions amending the EC’s draft regulation for deployment and commercial operation of Galileo were tentatively approved at a January 30 committee meeting. A final vote on the regulation as a whole by the committee and, later, by the full parliament had not taken place as Inside GNSS went to press. Parliament clearly feels emboldened by the fully public procurement of Galileo for which the legislative body must approve a budget. In a plenary session at the Munich Summit, Etelka Barsi-Pataky, a member of the European Parliament, noted that “Galileo is a Community project, fully funded from the public budget — taxpayer money. Although a “substitute” rather than a full member of the ITRE Committee, Barsi-Pataky is the Galileo rapporteur, the person appointed by parliament to investigate an issue or a situation and report back to it. ESA Opens Galileo Procurement: Let the Games Begin!